LG's webOS TV has been rumored for some time now, and was expected to be revealed at CES next week. 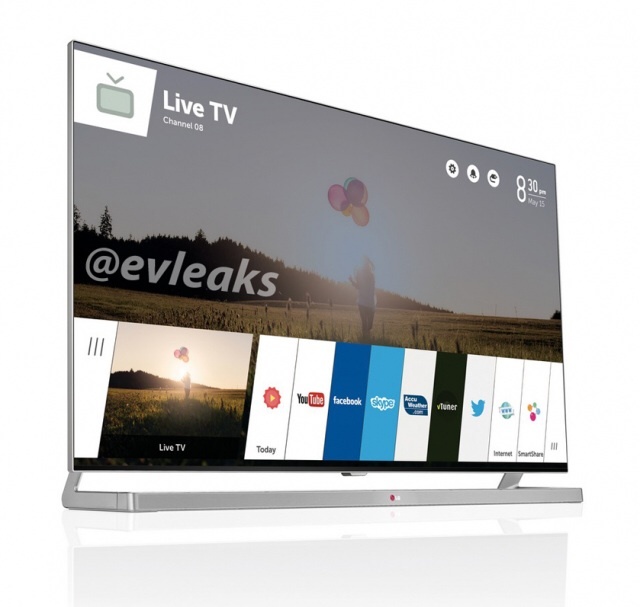 However, evleaks has posted an image of what they claim to be the LG webOS TV. The image shows the webOS Cards interface, featuring thumbnail of any apps and content running on the TV. 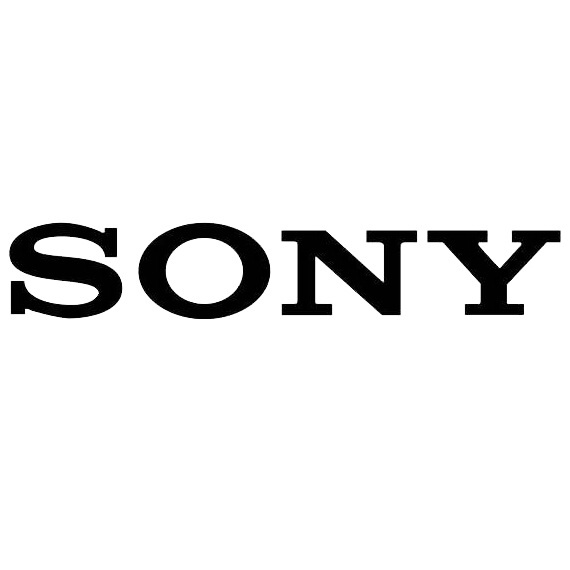 Apps such as YouTube, Facebook, Skype and Twitter are all listed in the photo as well as a web browser. Filippo Bigarella, the developer of Springtomize, has posted an update regarding Springtomize 3, the version that will support iOS 7 and 64-Bit devices. For those that do not know, Springtomize is the ultimate tweak to customize your device, allowing you to modify just about anything. Springtomize is the only tweak you'll ever need to customize your device, in all of its aspects: from its capabilities to the look of your SpringBoard. You can disable elements you don't use or that may slow down your device performances, you can customize the look of your icons, the dock, the folders and the Status Bar, or even your Lockscreen. Springtomize also allows you to save your SpringBoard layout and to restore it later, without wasting time moving icons inside folders or to their original positions! You can also customize various animations of your SpringBoard or add nice mods to current ones, like choosing the color of the screenshot flash or to dim your device screen like an old tv when locking! Finally, in the Theming section you can choose to apply a custom dock or battery; you can also make your icons transparent and set the brightness of your wallpaper! In the blog post regarding Springtomize 3, Filippo Bigarella notes that the app is going to be completely re-written and is 50% complete. As most of you know, I had already been working on Springtomize 3 before the release of evasi0n7: unfortunately, while I managed to get a lot of work done, I can’t really say I got much farther than 35-40%. This is mainly because of the fact that it’s not an update, at all; it’s a complete rewrite, based on a completely new structure designed to solve many of the technical challenges that a big project like Springtomize brings to the game (and if you’ve ever developed an iOS tweak, you may be able to guess some of them). From that 35-40%, I think I can safely say that, as of now, it’s at least half percent done: the “foundation” on which everything is based is nearly complete, many “hooks” have been written (which means that it already has a lot of features). What’s missing right now is expanding even more the number of available features and… Settings. Yep, settings are a big missing point when it comes to Springtomize, and require a lot of work and testing: oh, not even counting that they need to be designed to be as user friendly as possible, because I don’t want people to get lost. Beta testers have been chosen and I’ve just let them know they’re part of the team; I feel like they’re all very competent people with the skills required to help me make Springtomize better. I can’t really wait to show you Springtomize 3’s full potential, but please, bear with me while I try to do my best to build a product that people will enjoy. You will not be disappointed. 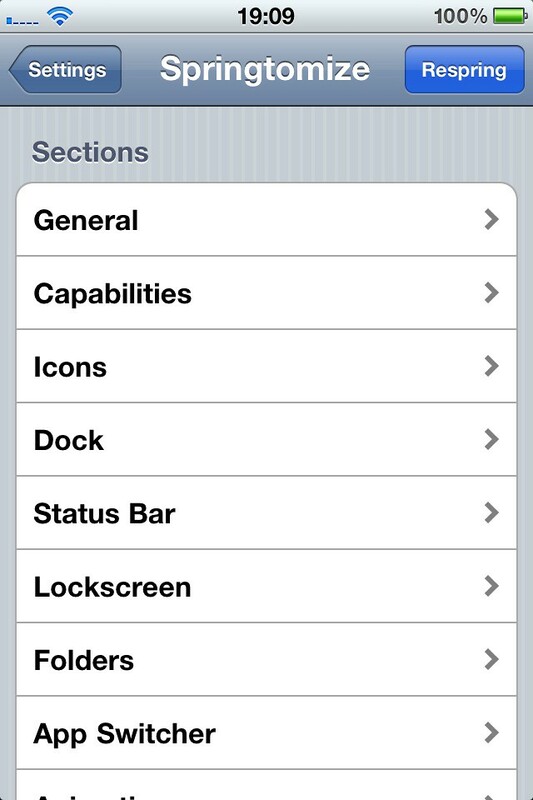 For those on iOS 5 and iOS 6, Springtomize is available in the Cydia Store for $1.99.